RV Mar 29 2019 5:51 am So handsome and at the same time, cute. Looking forward to see you a male lead role in a drama soon! Ayesha Jul 29 2018 5:54 am So much like Kang Ha Neul. I thought I wasn't seeing things properly. One angle he looks like him, and then the other he doesn't. Moonry Feb 06 2018 12:43 pm I love him so much when he played in Entertainer. He's such a good father in this kdrama, and he's such a good actor. I love him so much. kendall Aug 22 2017 7:09 am He is very handsome. 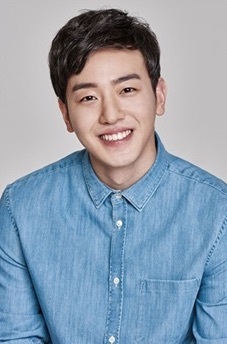 His smile made me fall in love, he looks just like Kang ha neul. I hope he gets back to the drama soon. Yara Apr 22 2017 9:46 am Omo the handsome dad from the entertainer ?? i love u so much and your acting too keep going oppa, you're such an amazing actor, you will have a bright future, i want to see you again please, harry up and made another drama, I'm waiting for you oppa ???? ♡ Mar 28 2017 2:53 pm He remind me of Kim Jaewoo,' Cha Dongjoo in Can you hear my heart?' I love her role in 'Queen of The Ring' Hwaiting!!! q_q baeri Mar 17 2017 8:29 am I was watching him in Queen of the Ring when suddenly i felt like i knew him from somewhere. Googled him. Turn out he's the guy with a kid in DDanddara (Entertainer). Demmm, he should start making an appearance more in kdrama land. Sooo good. Reenam Mar 10 2017 2:53 am I unfortunately didn't recognise him in queen of the ring drama but he did grab my attention just like in entertainer drama...and I m totally shipping him with seul gi in Q6 TR. ..fighting!!!? Sammy Dec 17 2016 10:44 am I really thought that he was Jung shin oppa , bassist of C N Blue? peh Oct 22 2016 12:24 pm I loved him so much that I'm here finally after looking on the internet for like EVER!! how is it his first time in drama???????????????? Deanie Oct 13 2016 7:10 pm WHATT?? This is his debut Drama?? I cant believe this. He succeed to get me surfing on google to know about him! His acting is no joke, and his facial expression is great! Yeah, everybody loves the way he smiles, I do! Well, I declare myself as his new fan now! mae Sep 17 2016 10:41 am OPPPAAA you are the best. i love you!!!!! Gi Es Aug 11 2016 6:24 am A great actor & with an awsome smile. Shajie Aug 10 2016 8:48 pm This oppa... will be a big hit i believe him... fighting!!! Your smile is THE BEST!!!! temperance Aug 08 2016 2:30 am OMG!!!! You are a very good actor! Your character in Entertainer is really amazing.. You made me cry a lot. I will never forget that scene when you and Chan Hee were crying. You were full of emotion and it you made a selfless acting out there. I suddenly wish the character was in real life. Fighting! More dramas to come . . .
Jiminie Jul 04 2016 9:33 am I think everyone loves his smile and how he act as an actor. He is quite good! More kdramas for you soon i assume! Fighting! aecha Jul 03 2016 11:20 pm I like the way when he flash his smile. şiirsever Jun 24 2016 1:36 pm you are very cute boy, really. irmar Jun 24 2016 2:11 am We all loved you in "Entertainer". And we want to see more of you. qistina Jun 22 2016 12:40 pm wow...i just done watching ddandara...so happy...your birthday is on the same day as i am..i am a fan..will wait for your other work..i will alwys support you...fighting!! yawaedaf93 Jun 20 2016 5:33 am Congratulation for your first drama series...I will always cheer and support you...Stay bright and keep it up with that lovely and warm smile :) fighting! Elli Jun 20 2016 12:53 am Lee Tae-Seon made a really big impact. His character of a pure, innocent father was portrayed with perfection. A big thank you to all the casts and crew of Ddanddara for making us (viewers) love music more. Syi Jun 19 2016 1:41 am Debut drama and already one of the lead roles?! The casting team for Entertainer certainly got good taste and did great! clehman Jun 16 2016 6:37 am i like the cute love story of him and Chae Jung Ahn i hope they will have their own drama kinda same concept that they have now. Iman Atiqah Jun 15 2016 10:25 pm congratulation for your first drama series..hope can see u another drama ..fightinggg!! Carolyn Jun 11 2016 3:42 pm Really enjoyed his debut performance. His smile is contagious. Sam Jun 10 2016 7:50 am Hope to see him another drama after this like his overall persona. Very cute has a very nice smile. Reenie Jun 09 2016 8:49 pm What an impressive first tv performance. I have a feeling we will be seeing a lot of this young man in the future. Way to go! Eve Shelby Jun 08 2016 9:26 pm Looking forward to seeing lots more of this young man! Sarah Jun 02 2016 8:37 pm Oh man, I seriously thought he was Feeldog cause they both have that cute smile lol! It's crazy that he's only a rookie actor cause he's so good! Merong May 31 2016 9:15 pm Kinda dissapointed when i googled about him to know that this is his first drama cus i need to watch more of him!! I like it when he was giving a fatherly smile to his son(in the drama) and his acting in is just daebak for a rookie actor. I need him to play the main lead for his nxt drama like RIGHT NOW. cim May 31 2016 2:10 pm I love him in Entertainer! WOW. Great acting for his first drama. Another Fan May 30 2016 7:54 am I cannot believe this is his first drama! His acting skills in Entertainer is really good! I hope he will get more casting after this drama. Fighting! KLN May 30 2016 3:59 am How tall is he? 하늘 May 28 2016 3:58 am oppa is very cool! he looks like Kang Haneul/female version of snsd hyohyeon when he smiles ~!!! Fan May 27 2016 7:44 pm Wow! You act so well! That crying scene in Episode 12 got me. I want to comfort you haha. You're soon to be idol right? I am your fan now. Looking forward fighting! Kpop/Kdrama Eye Candy Junkie May 18 2016 9:47 am OMG! His smile gets there 10 minutes before he does - totally melts my heart! He becomes more and more my favorite character on The Entertainer. Great charisma!! hello May 17 2016 4:02 pm super cute, and his smile is so attractive!! Diana May 16 2016 1:03 am Aye fam, you're cute n all. Yall be successful! star May 10 2016 8:21 pm I think he is Baro cause he is so cute! His smile literally same as Baro. Is it his debut drama? Omo.. i think his acting very cool. As father who loving his son. Neomu neomu choa!! Fan May 10 2016 8:19 am lol you resemble baro so much. I kept comparing you both. Your smile is more cute but baro is more handsome ahaha. Carolina carvalho May 02 2016 10:09 am His so cute, he's already my bias now! Anna Apr 30 2016 9:02 am when i saw him in Entertainer. I think he's cute though. The way he smiled awhh gwiyeowo! His acting amazing! Daebak! Whishing he'll go hit! hope to see him in other dramas tho! i'm new fans of you!! K Apr 30 2016 7:02 am First time I saw him in Entertainer, I was wondering if he was Baro. But I knew it wasn't him. But now becomimg a fan! His acting is great and I enjoy his character as a cute and respectable father. I hope to see him in other dramas after Entertainer. ikasifa248 Apr 29 2016 7:53 pm His face mix of Baro & Kang HaNeul..
tali Apr 28 2016 11:06 pm He's a mix of Baro, Kang Haneul and FeelDog. That's why he looks so familiar to me! He's really cute! Mary Apr 28 2016 6:27 pm I know who he reminds everyone of !!!!!!!!!!! You won't believe it !!!! Rachel Apr 28 2016 1:43 am why do i feel like i've seen him somewhere before? does anyone know if he's been in another drama? Haru Apr 27 2016 10:11 pm Who is this guy? i'm watching Entertainer now and i'm attracted to his bright smile! Ethar, I think you referring to Feeldog. He is a member of Bigstar and although they have similar smile I don't think they are the same person. exo_L Apr 23 2016 9:17 am shinee's taemin"s brother?